Discussion topics in the divorce world often include ”dating, starting over and finding our new selves." But the topic that seems to always gets glossed over is motherhood – not the motherhood that helps our children navigate this new world, not the motherhood where we feel sad and broken for our children and the pain they’ve had to experience so young. I’m talking about real mothering – the kind that makes you cry out of frustration, the kind that makes you hate yourself for not being enough, the kind that makes you not want to see your kids, the kind that society expects mothers will never experience, let alone discuss. Like an Instagram filter, motherhood is often whitewashed with positivity (with the occasional expression of comedic frustration). Women are expected to find a balance somewhere between the good, kale-feeding, screen-time-limiting mom and the I-want-to-drop-my-kids-at-the-fire station mom. But motherhood is so much more than that and the expectations are so much higher. It’s just expected that a mother will do it all; drop a school course because her son needs her home, sacrifice her social life because she won’t go out when the kids are home, restrict her dating life based on the needs of her children. Because, after all, sacrifice is what being a mother is all about, right? Nobody said motherhood would be easy, but you asked for it, right? 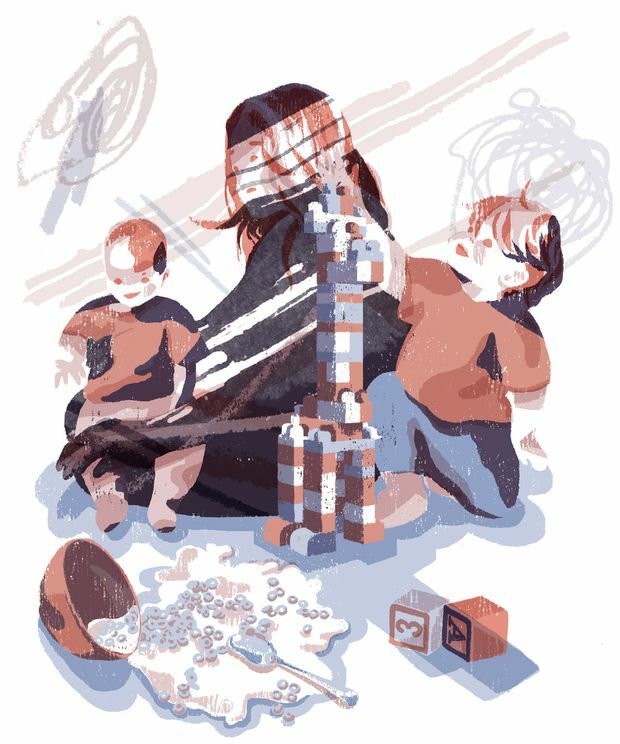 The motherhood we have ascribed to today is downright stifling. Our children are extensions of us and define our status and value in society. If they are doing poorly in school, it’s because we aren’t doing homework with them. If they’re misbehaving, it’s because we didn’t cuddle them enough as infants. If they’re getting sick all the time, it’s because we didn’t breastfeed them or our houses are too clean and our kids aren’t exposed to germs. The finger always points back to the mother and if you’re a single mom, it feels like it’s the whole damn hand. Last week, I lost it on my kids. I came down in the morning to see my kitchen ransacked by my four year old. A milk and grape-juice concoction floating on the counters, cereal lightly sprinkled but somehow also stuck in the grout of the floor tiles. Unbeknownst to me, there was a squishy cupcake and an orange section in the oven that I would only discover a few days later when I turned it on and my house smelled like a Mattel factory drowning in mimosas. My older kids were watching TV, and claimed ignorance as their defence. I saw all this and lost it. The kind of losing it that we convince ourselves will put them in therapy; the kind that makes us feel miserable to our core; the kind that puts fear in our children’s eyes; the kind that has us feeling isolated and alone, because we aren’t supposed to talk about it. Lately, I’ve noticed that even the self-care philosophy extended to motherhood is cloaked in the guilt of motherhood. Take care of yourself, so long as your manicure doesn’t cut into time with your kids. Treat yourself to something new, so long as you’re still able to buy your child that pricey water bottle their life just isn’t complete without. Take care of yourself, but not at the expense of anyone else is the message. Why not – at the expense of everyone else, take care of yourself. We all need to learn to express empathy for others' misfortunes without condemning our blessings. When we see a mother in need and asking for help, and all we can say is, “Well, you think that’s bad, you should see my life!” it’s like telling a child whose stomach hurts, “You want stomach pain? Try being pregnant!” Then the child refuses to talk about their pain, and you end up taking a 3 a.m. trip to the ER to have their appendix removed. We let mother’s get to the 3 a.m. stage. We shut them down and we don’t listen. We don’t listen until it’s too late and the screams of pain are too loud to ignore. I don’t have the answer. I started yoga to calm myself, and have an online shopping cart full of self-help books waiting to be purchased. I may not know what the solution is, but I do know we need to start listening to one another. We need to listen to mothers when they say they’re at their end. We need to listen to women when they say they need help without using those direct words. Mostly, though, we need to listen to ourselves. We need to pay attention to our inner compass when it tells us we are breaking. We need to safeguard ourselves to avoid getting to that point. We need to protect ourselves and our well being with the same tenacity we do our children. The greatest gift we can give our children is the best version of us. Even as I type this, I’m wondering how the heck I do that. I’m not sure, but I know that forsaking my needs and emotional and mental well being is definitely not the way. When mama bear is fed and doing well, so are the cubs. Daniella English lives in Thornhill, Ont. Pot smoke reeks! Or am I just losing touch with my more liberal self?